Different eras have different needs from their heroes. Just look at Captain America, created during WWII, versus Wolverine, born in the anti-establishment 70s. What do we crave in a hero for our post-GFC times? I would suggest that we are desperate for a model of someone who is willing to speak truth to power. Paulina is a character who appears in one of Shakespeare’s last plays, The Winter’s Tale, which is a kind of almost-tragedy that somehow works towards a mostly happy ending. Written about the same time as The Tempest, it is for me a much richer and more challenging play. The story is about a king who becomes obsessed with the, entirely false, notion that his pregnant wife is having an affair with his best friend. His friend bolts, he imprisons his wife, who has a baby girl in jail. Paulina is a noblewoman, friend of the Queen, wife of one of the courtiers in the King’s inner circle. She swoops in on the King, carrying his new daughter, and tells him openly that everything he is doing is wrong, declaring, ‘If I prove honey mouthed, let my tongue blister’. 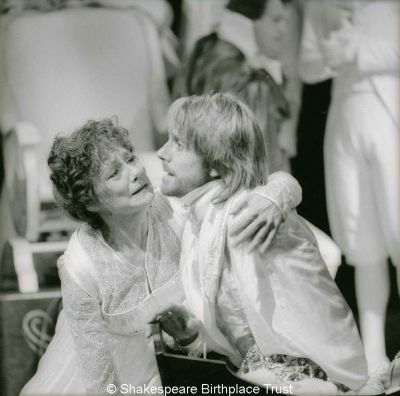 Gillian Barge and Jeremy Irons in the 1986 RSC production. When the King bombards her with misogynist epithets, witch, hag, crone, the whole bit, and threatens her specifically with the fate of witches (‘I’ll ha’ thee burnt.’), his obvious unreliability makes the insults look bad, not their target. Think of Bob Ellis or Alan Jones in rant mode, when the concern relates to this person having been allowed a platform where his voice has power, even while the abuse itself should be laughable. Witch hunts went on at the time this play was written, and women in Europe really were burned. How did it sound to an audience of the time of James I to hear these accusations in the rantings of a tyrant madman? In designating Paulina as a witch while the action of the play makes her a positive, even heroic figure, such accusations against women are themselves brought into ridicule. Paulina’s courage is for all. She tells a humble jailer who fears the King’s retribution, ‘I will stand between you and danger.’ None of Shakespeare’s more obvious heroes, not even Henry V, ever indicates that he would be willing to defend bodily someone of lesser social standing. When Leontes, too late, has regained his wits, Paulina is rewarded with his exclusive trust. In this play the man who fails to listen to an angry woman is left to lament ‘O that ever I / Had squared me to thy counsel!’. It would be an understatement to say that some of Shakespeare’s plays have a greater emphasis on the female than others. It is not only that some have more female roles, or larger speaking parts for female characters, but also that some include more prominent uses of imagery and mythology traditionally associated with the female, and some dwell more lingeringly on the experiences of the female characters and the concerns that female audience members might see as pertaining most closely to their own experiences. Paulina’s control over the play’s dénouement, in which she brings about a seemingly impossible reconciliation between the central characters, makes her a magician of ‘lawful’ magic, midwife to renewal and hope. It would seem that The Winter’s Tale, with its representations of loyalty between women, pregnancy, childbirth, witchcraft, the threat posed by the absolute legal power of a husband over his wife, the possibility of a wife having less officially sanctioned kinds over power over her husband, healing through ancient wisdom, and the passing down of a connection from mother to daughter, may well be the most female-centred of all Shakespeare’s plays. 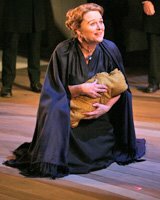 Sinead Cusack in the 2009 Bridge production. The popularity of this play in recent years cannot be ascribed solely to a growing cultural affinity with the character of Paulina, but it is possible to believe that a recent, urgent need for a person who will hold those who have been accorded too much authority publically accountable for their reckless actions has some meaningful part in it. As his career progressed, Shakespeare relied more and more on his outspoken women to be the figure of our hope that there will be someone who will stand up and say what needs to be said. 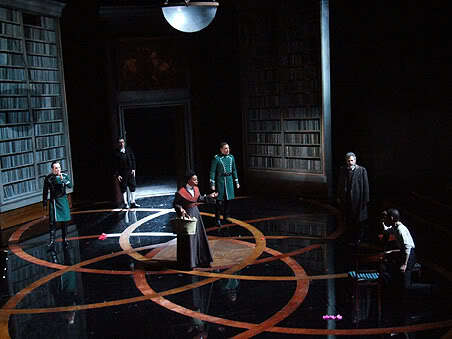 Noma Dumezweni in the 2009 RSC production. That was fascinating Orlando, thank you. How on earth have blokey critics coped with Paulina over the decades? Something else I read once (which was about occult imagery, so mostly not relevant here) pointed out that this is one of the very few stories where the “abandoned heir” is a girl. @SN, although I avoid the practice of linking what Shakespeare wrote to his personal life, it’s hard not to notice the extreme proliferation of young women as heirs in his late plays. Leontes has Perdita, Lear has Cordelia, Cymbeline has Innogen, Prospero has Miranda and Pericles has Marina. All girls on the cusp of womanhood named for the feature that distinguishes them in the plot. If we discount Lear because it’s a tragedy, the others all position the daughter at the end of the play to be the one expected to lead their society into a more hopeful future. @Hedgepig, because Winter’s Tale is such an ensemble piece it is easy for reviewers to avoid focussing on Paulina too much, but to tell the truth they’ve generally been very admiring of her for some decades now. Although I do recall one who described Antigonus’s standing up to the King as ‘courageous’ but Paulina’s as ‘brazen’!